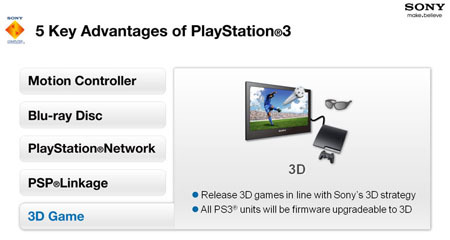 Sony has formally announced plans to bring true 3D gaming to the PlayStation 3. In a presentation designed to outline the “five key advantages of PlayStation 3”, Sony stated: “All PS3 units will be firmware upgradeable to 3D.” The company also promised to “release 3D games”. Sony has spoken about taking the PS3 3D before, even demoing a PS3 running 3D versions Gran Turismo Prologue and MotorStorm at the Consumer Electronics Show (CES) back in January 2009. But this is thought to be the first time that the electronics giant has officially promised that the console will go 3D. 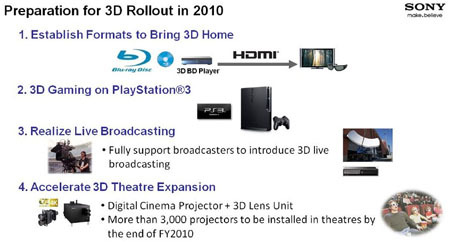 Rollout of “3D Gaming on PlayStation 3” will start next year, Sony’s presentation slides revealed. Will PS3's appear in cinemas?